From the New York Times, 5th January 2014. Those six little words, tossed off like a request to please hold the mustard, were among the most deconstructed in Tom Daley’s YouTube video last month, in which the 19-year-old British Olympic diver announced that he was dating a man. But the cheers were premature, or at least qualified. Despite the trending Twitter hashtag #TomGayley, Mr. Daley never used the word “gay,” and there was the matter of his still fancying girls. While many commenters embraced the ambiguity (“I don’t care if Tom Daley’s gay or bi or whatever … He’s still fit,” one tweeted), others raised eyebrows. Today marks the 14th annual Bi Visibility Day, an event held to challenge biphobia by promoting the rights and legitimacy of bisexual people alongside the rest of the gay community. In this article, PinkNews writer Aaron Day reflects on his experiences growing up inside two closets, and explains why bisexual visibility could be considered one of the defining LGBT rights struggles of our time. Bi Visibility Day (Sept 23) is now 14-years-old, which makes it approximately one year younger than the Transgender Day of Remembrance, and a whopping fifty years younger than the first ever recorded gay pride movement. It was first launched in 1999 by US activists Wendy Curry, Michael Page, and Gigi Raven Wilbur. Their intention was to challenge the widespread assumption that people are either born gay or straight – an assumption that has so far led many to believe in the absolute nonexistence of bisexual people. Curry, Page, and Wilbur are also responsible for the signature bi pride flag we all know today, with its distinctive tri-colour (pink, purple, blue) design. It is this symbol I have since come to identify with as a bisexual man – a symbol that enables me to feel welcomed as part of a open community after spending a great deal of my life feeling both isolated and disconnected from the rest of the gay world. 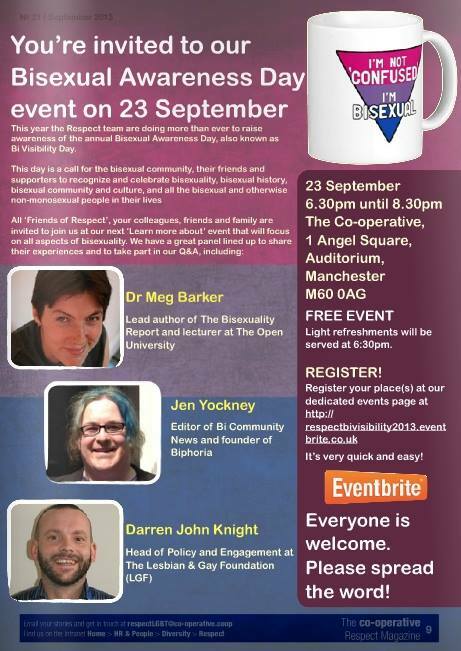 Meg from BiUK will be taking part in this event tonight for bi visibility, along with Jen Yockney from Bi Community News. There’s a very useful article over on The Huffington Post about Google’s block on the word bisexual. Unlike the words lesbian, gay or trans, Google has blocked bisexual from its auto complete and instant search features. This means that if you type the word into a Google search you don’t see the other words which people have commonly searched for alongside bisexual, and you don’t get an instant sense of the million of web pages related to bisexuality, bisexual communities and bisexual resources. This has very real impacts, for example the article mentions one man who searched on Google to find out whether anyone was in his situation (by looking to see whether anyone had searched for bisexual and suicide). Finding nothing he assumed he must be alone. Well done to BiMedia for noticing the blockage of bisexuality a year ago, and to BiNet USA for picking up on it now. 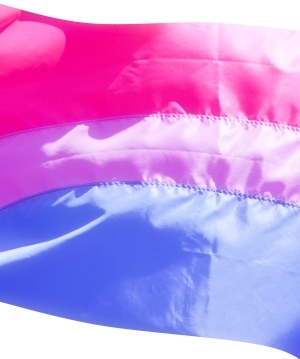 The president of BiNet USA, Faith Cheltenham, writes a fascinating analysis of this situation, in relation to bisexual invisibility, and calls on Google to change their policy. BiUK certainly support this call, and the research summarised in The Bisexuality Report would suggest that this is exactly the kind of area where we need to increase bisexual visibility. Things are going very well with The Bisexuality Report since its launch on February 15th. The launch itself was a great success with attendees from many organisations, groups and political parties. The Metro Centre and Stonewall (who sponsored the event) gave great speeches about how useful the report would be, and the Government Equalities Office were extremely positive. We are now working with them (and BCN and The Bisexual Index) on five key recommendations to prioritise putting into practice. 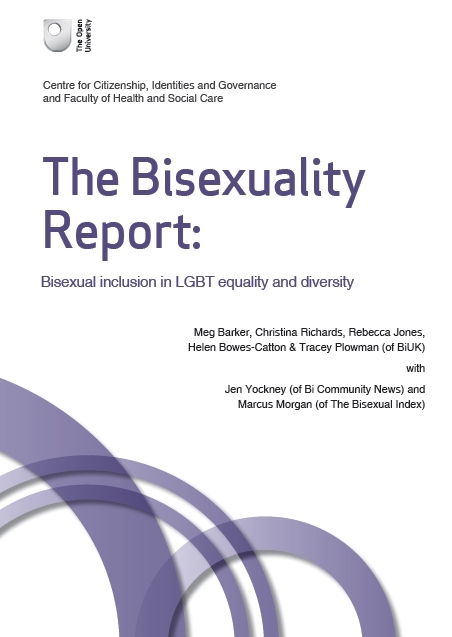 So far there have been over 20,000 downloads of the report from the various places it is available online (here, on The Bisexual Index, and through the Open University)! Also, the American Institute of Bisexuality is keen to put the report on a free memory stick to give out at the various sexology conferences that are happening this year (along with the Stonewall report on bisexuality in the workplace and the San Francisco Bisexual Invisibility report). We hope to give the report out at BiReCon and the LGBT health summit as well. The report also made it into various newspapers, magazines and radio programmes. We’re keeping a list of media reports here.